Arville Textiles, which makes fabrics for bullet-proof vests and fire-proof suits, said it will create more jobs this year after receiving funding from the Government-backed Digital Enterprise programme. The Wetherby-based business, which makes some of the world’s most high-tech protective and safety fabrics, has secured £9,000 of funding to boost its digital technology. The specialist weaver, which was established in 1954 and employs 100 people, specialises in performance fabrics that are also used to make bomb disposal suits, emergency flotation systems for aircraft, life rafts and aircraft escape slides. Money from the Digital Enterprise programme will enable the firm to create jobs by funding new digital systems that will streamline Arville’s internal communications systems and increase efficiencies. 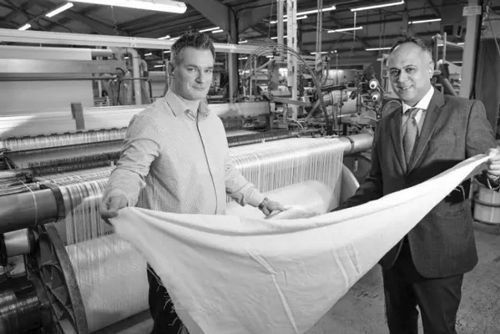 Andy Smith, Group Head of Marketing at the business, said: “We’re proud of our heritage as a Yorkshire manufacturer, having started out over 60 years ago weaving woollen textiles for public transport staff uniforms. Over time we’ve evolved into a specialist in our field, working with extremely advanced industry sectors that are among the most challenging and demanding in the world, and we need our business processes to reflect that.” He said the Digital Enterprise funding will enable the firm to invest in a factory-wide wi-fi system to operate a new barcoding scheme. “Our new technology is already leading to growth, with a 15% increase in turnover expected for the current financial year, and we plan to be making new hires during 2018,” he added. Funded by the Leeds City Region Local Enterprise Partnership, its nine local authorities and the European Regional Development Fund, Connectivity Vouchers are aimed at small businesses whose current download speeds are less than 30 mbps, firms in areas with poor network coverage, as well as those involved in high levels of data transfer with a defined business need for improved upload and download transfer speeds.